This is the first of a new series of blog posts in which I ask writers questions about how they use social media. Claire Dyer is a novelist and poet, with two novels and a poetry collection to her name. 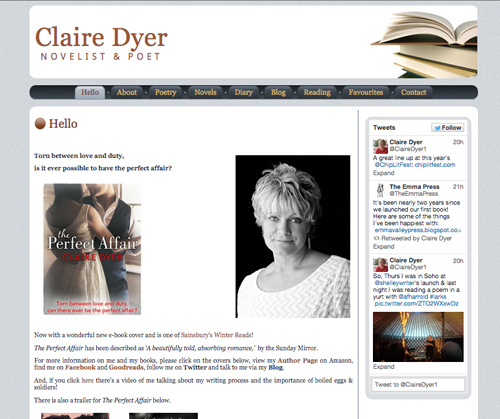 Her website clairedyer.com combines a blog with details of her published work, what she’s reading and where she’s appearing. She also displays her Twitter feed. I first met Claire at a magazine launch at the Albion Beatnik Bookstore in Oxford – she is widely published in poetry magazines – and I was interested to hear how she approaches social media. I blog when I have something to say about my writing, other people’s writing, the writing life or just to say how nice or difficult the whole business of writing is! What do you do if you’re too busy to blog? I pop stuff on Facebook (my personal and Author pages) and Twitter. I also use Pinterest but not very regularly. Yes, I’ve signed up for a couple (by email) but normally just keep a watch out for interesting blogs by people I admire and will retweet or share them when I can. I have made a private list of ‘People who Tweet Interesting Things’ on Twitter which I monitor so often discover blogs there. 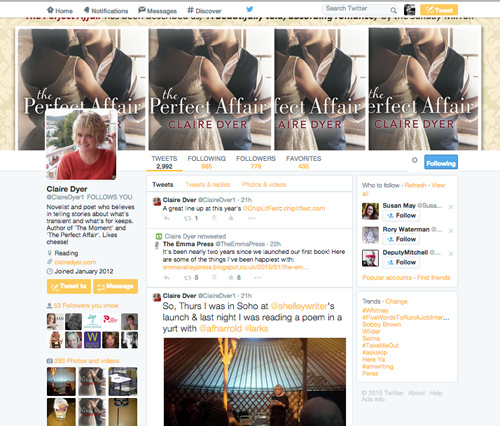 I regularly use Facebook and Twitter and try and steer the tricky line between being ‘Claire Dyer the person’ and ‘Claire Dyer the writer’. What I’ve found is that the private and public sides to being a writer are very different and it’s not always easy to manage this in the right way. Someone once told me that using social media is like being at a party so it’s not a good idea to arrive, shout out your own news and not listen to others’. Therefore my guiding principles are to be interested in other people, be supportive of their initiatives, be funny, not moan too much and let people know what I’m up to but not in a pushy way. How do you manage the time you spend on social media – do you have any rules or tricks, and do you use a social media dashboard eg Hootsuite or Tweetdeck? I mostly use my ‘People who Tweet Interesting Things’ list on Twitter. I belong to a number of Facebook Groups so that’s helpful in tracking what’s going on but usually I dip in and out so do risk missing things. A friend did mention TweetDeck to me but I haven’t managed to get my head round downloading it yet! How do you balance social media activity with your actual writing – do you have any rules you abide by, or any tips/advice you would give to other writers? Log out of Facebook and Twitter when writing otherwise you WILL get distracted! I love social media when it’s positive and supportive and when it serves to disseminate news and information. I do, however, find it hard to deal with it when it is used for negative reasons or when an online discussion gets personal. My tenet is that if I don’t have something nice to say, keep quiet! Claire’s latest novel is available in paperback and as an e-book, The Perfect Affair – it’s been described as ‘A beautifully told, absorbing romance,’ by the Sunday Mirror, and it’s currently a Sainsbury’s Winter Read. You can find out more about Claire and her books on her website and blog, via her Amazon Author Page, on Facebook, on Twitter and on her Goodreads Author Page.